Two former Chinese football chiefs and a number of former national team players involved in a match-fixing and bribery scandal have been handed jail sentences in the country’s latest crackdown on corruption in football. In total, 24 former football officials or players were punished for match-fixing, bribery and racketeering. 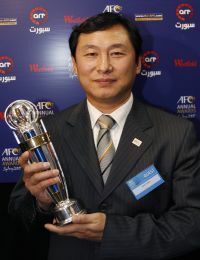 Former Chinese FA vice president Nan Yong and his predecessor Xie Yalong were each given 10½ years in prison following the two-year corruption investigation. Ex-China team captain Wei Shaohui got a similar jail term, while a senior Chinese FA official, Li Dongsheng, received a nine-year prison sentence for match-fixing. Four former national team players and four referees were each given sentences of up to six years in jail. Chinese football experts have praised the government for trying to clean up the sport in the country that for years has been riddled with corruption. “You can see the improved environment ever since the crackdown on soccer corruption was launched,” Xie Liang, a Radio Guangdong commentator was quoted bu China Daily. French international and former Chelsea star Nicolas Anelka now plies his trade for Shanghai Shenhua. Chinese Super League champions Guangzhou Evergrande, managed by World Cup-winning coach Marcello Lippi, have qualified for the last eight of the AFC Champions League. They will meet two-time winners Al Ittihad from Saudi Arabia in September. “For several years, up to this season, no team from the Chinese league competed in the last eight of the Asian champions league,” Xie said. China Daily reports that crowds are on the increase in the Chinese Super League, quoting football federation figures showing that a record 4.23 million fans attended matches before the mid-season break. But the punishments handed down to Chinese football officials and players may only be the tip of the iceberg, according to others. Former Zhejiang sports chief Chen Peide told the newspaper that he was not optimistic this season would be free from match-fixing and bribery and warned there was no quick fix to eradicate corruption. “It will take a long time to solve the problem because the current system is a hotbed of corruption,” he was quoted as saying. Chinese football observers say the country’s FA must relinquish responsibility for operating the professional leagues to independent groups to reduce the possibility for corruption. In Europe, worldwide players’ union FIFPro is calling for all stakeholders in the game to unite for a joint initiative in the fight the scourge of match-fixing. Ahead of Euro 2012 in Poland and Ukraine, UEFA president Michel Platini warned that any player convicted of match-fixing would never play professional football again. Both Italian and Turkish football have recently been mired in match-fixing scandals. FIFPro’s European division believes a joint approach “has a greater chance of success than individual initiatives”. “In this fight against match fixing, the football world needs the assistance of the authorities. More and more governments recognise that their help is essential because the criminals running these bribery schemes are well organised,” said a statement on FIFPro’s website. FIFPro is proposed to set up, in collaboration with the other stakeholders, an information programme to warn players against participation in match-fixing. It also wants to launch a code of conduct for professional football, and not only the players, pointing to similar guidelines drawn up in the UK to combat bribery in cricket and horse racing.